The new rule is part of a wider city pushback against perceived commercial exploitation. Public advertising is pollution and it needs to be curbed. So insists a new policy from Barcelona, which will substantially cut back on how much advertising City Hall permits in public places. 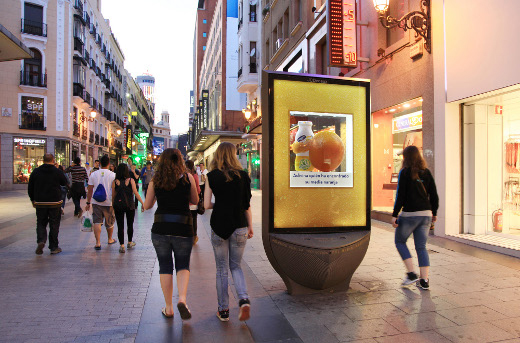 In a bid to make Barcelona a more attractive, less aesthetically cluttered place, street advertising in the city will be reduced by 20 percent in July 2016. This reduction won’t come in the form of a ban—the city will simply reduce the number of places where advertisements can be placed. Specifically, the city will remove 14 percent of its so-called MUPIS, double-sided billboards that stand in many streets and rise to roughly 10 feet. Some of the billboards that remain will eventually feature advertising on just one side. “Barcelona is a city heavily polluted city by advertising, twice more so than other Spanish and European cities. [The new plan will help us] to enjoy a friendlier public landscape that is less stifling, without affecting municipal revenues." The cleanup shouldn’t prove too tricky, given that the city itself owns the billboards. The city’s plans don’t stop there, however. Pisarello insists that Barcelona can simultaneously cut the amount of advertising space it offers and raise the fee that sub-contractors pay to use the billboards that remain. Since 2006, the minimum bid the city has asked for the billboard contract has been €10.5 million ($11.7 million). From next summer, Barcelona will ask for bids to start at €12 million ($13.4)—while the winning bidder will be expected to invest an additional €1 million in street furniture. Either this price hike is wildly optimistic on the city’s part, or Barcelona has so far been selling its billboard space far too cheap. The change is still about much more than taking down a few ads. Across the board, Barcelona Mayor Ada Colau’s administration has been fighting to cut back on what it sees as commercial exploitation of the city. Since being elected last June, Colau has cracked down on illegal holiday apartments and commercial bar crawls and is currently conducting public consultation on whether or not to de-privatize (and thus allow citizen access to) the city’s marina at Port Vell. Presiding over a city where many worry that tourism is out of control, Colau’s left-leaning coalition has also attempted to freeze some new hotel construction, with mixed results. None of this has as yet markedly changed Barcelona’s appearance as a busy commercial center, but the moves have raised some interesting questions. How much advertising is too much? Do attempts to regulate businesses in Barcelona risk alienating investors, or do they safeguard their investment by preserving the city’s bankable, attractive character? As the answers to these questions reveal themselves, Barcelona’s new controls could prove either a cautionary tale or a template for other cities. It will be interesting in the coming years to see which way the needle swings.